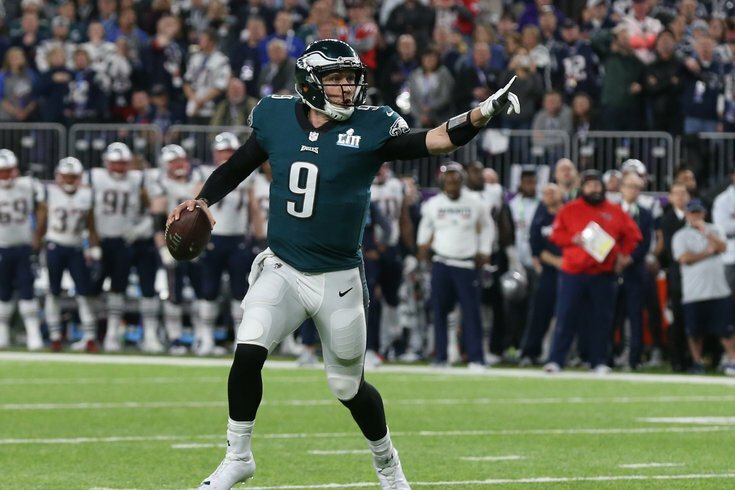 Nick Foles likely won't have any suitors, unless some team loses their quarterback and gets desperate. After the start of the two-day 2018 NFL free agency tampering period, or more accurately stated, the start of free agency, there has been a lot of quarterback movement in the NFL, none of which, of course, has involved Nick Foles. 5) Denver Broncos: The Broncos reportedly agreed to terms with Case Keenum for what is thought to be a two-year deal worth $36 million. Those are the same numbers Sam Bradford got in Philly during the 2016 offseason, when the Eagles viewed him as a bridge quarterback to whoever they were going to land in the 2016 NFL Draft (which of course turned out to be Carson Wentz). This feels like another "bridge quarterback" situation in Denver, who would no longer have any need for Foles. Foles trade likelihood status: Out. 4) New York Jets: The Jets re-signed Josh McCown to a one-year, $10 million deal, and also plan on signing Teddy Bridgewater, per reports. Most expect the Bills to be serious players in the draft, as they are likely to package some of those picks to move up and draft a quarterback. If they are indeed quarterback hunting in the draft, it wouldn't have made much sense for them to trade their starting quarterback for a third-round pick, and then turn right around and trade a much higher pick for a player like Foles to be a bridge quarterback to whoever they land in the draft. Foles trade likelihood status: It depends on whether or not they do intend on drafting a quarterback or not, but that looks a lot like the case. If so, they would be out on Foles. 2) Minnesota Vikings: The Vikings "won" the Kirk Cousins sweepstakes, signing the former Redskin to a fully guaranteed three-year deal worth $86 million. 1) Arizona Cardinals: Good God, what are these idiots doing? First they signed Sam Bradford to an absolutely laughable one-year deal worth $20 million. Assuming Bradford pockets the $20 million in full, he will have earned $134,084,404 over his career, despite having only 34 career wins since he entered the league in 2010, and never winning more than 7 games in a season. And the crazy part is that Bradford' last contract, as noted above, was a two-year deal worth $36 million, or $18 million per season. In 2017, Bradford played in just two games because he was sidelined with some mysterious knee injury, which is concerning enough for any player with an otherwise normal injury history, but a red neon flag for a walking ACL tear like Bradford. And the Cardinals somehow thought is was a good idea to pay him MORE MONEY THAN HIS PREVIOUS CONTRACT. But then they weren't even done there! Then the Cardinals reportedly agreed to terms with Mike Glennon, because, um, they're trying to get Larry Fitzgerald to retire? That's the only explanation I have there. Foles trade likelihood status: You would think they would be out, but who the hell knows when the two above moves made no sense whatsoever. If Foles is to be traded, it'll probably have to be to a team that loses their quarterback just before the start of the 2018 season, like in the situation where the Eagles traded Bradford to the Vikings for a 1 and a 4.